HAPPY MAY FLOWER! 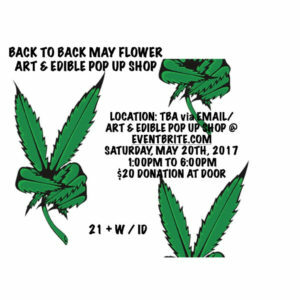 COME JOIN ART & EDIBLE BACK TO BACK MAY 20TH, 2017 AT 1PM to 6PM. BIGGER VENUE Lots of Fun. Great Vibes. Creative People. Cool Art. Different Exclusive Edible Tasting! Bartender on Duty! Drinks for Sell. Always Free Pre-Rolls for the early birds. So arrive EARLY!! RSVP & TELL A FRIEND, TO BRING A FRIEND!